St Paul’s Cathedral in London hosts a vast collection of religious art, with homage to Jesus, Mary, and all the saints in oil paint, mosaic, and marble; the current display at St Paul’s now includes today’s art forms more often found in East London galleries, such as video installation and graffiti paintings commissioned from local street artists. Old art or new, in both passion and faith is undeniable, proving contemporary art has its place alongside the traditional art in a cathedral. Nor would have I before imagined Bill Viola’s four “Martyrs” vid in which each person is alternately consumed by dust, wind, water, or flame. I couldn’t help but watch this one three times, made all the more captivating by the sounds of choir practice exuding through the nearby screen. But wait there’s more, right out in the open where it can’t be missed is some honest-to-God street art with a sensitive portrayal of Mother and Child, whooshed 2000 years into the present…as refugees. Robert Jeffs, ‘St Paul’s Watch’, 2015, spraypaint on board, at St Paul’s Cathedral, London. Image courtesy londoncallingblog.net. CBloxx was commissioned to create “Madonna” for awareness of the ongoing European refugee crisis, along with the fundraising campaign for Save the Children (with proceeds going directly to the charity). Along with this and another large painting by Inkie, is “St. Paul’s Watch” by Robert Jeffs, showing a early-century London firefighter who protected St Paul’s during World War I. Staying true to the edgy nature of graffiti work, these were painted in situ (but of course, with St Paul’s knowledge and a public audience! I’m sure nobody sneaked in and left these 6 x 6 foot works in the middle of the night). Around behind the main alter, two contemporary icons are displayed; the first is an icon of St Mellitus, who founded St Paul’s in 624AD. Alongside St Mellitus is an image of St Paul himself with a bird on his shoulder, the now-extinct New Zealand wattlebird, in “St Paul and the Huia” by New Zealand-Maori artist-priest Regan O’Callaghan. 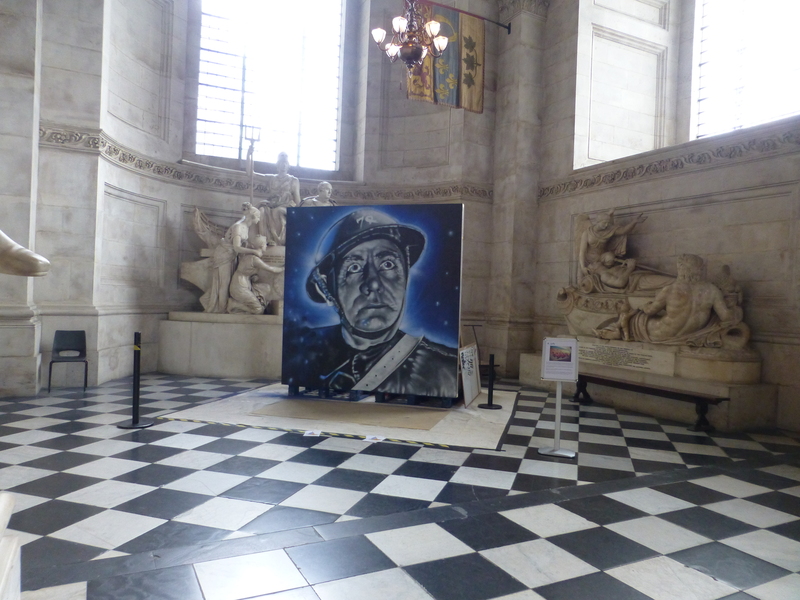 Regan O’Callaghan, ‘St Paul and the Huia’, 2015, by Regan O’Callaghan, at St Paul’s Cathedral, London. Image courtesy the artist. Neither Anglican nor Catholic myself and curious about why St Paul’s always looks like he does (brown, bald, and pointy beard), I looked him up on Sir Google and found an “icon reader” website. In the first important distinction, icons are often referred to as being written not painted (though nowadays some theologians consider the distinction to be purposeless). As for St Paul, he’s always depicted with brown hair and a pronged beard (because, tradition). Also, the symbol for great wisdom and learning is a hairless high forehead, with or without the little tuft on the crown. Lastly, St Paul always has a big tome in his hand because he is thought to be one of the most prolific contributors to the Bible’s New Testament. at St Paul’s Cathedral, London. Image source unknown. JMW Turner’s tombstone, at St Paul’s Cathedral, London. Image source unknown. Pondering icons as I wandered downstairs to the Crypt, I realised I was standing on “Artist’s Corner” where one can examine memorial tablets inscribed with lofty names such as JMW Turner, John Everett Millais, William Holman Hunt, John Constable, Frederic Leighton, Henry Moore and others; entombed alongside composers and writers (Blake, Donne), soldiers (Nelson, Wellington); heads of State; modern-day saints (Florence Nightengale); and of course, the 17th c. architect of the existing Cathedral, Sir Christopher Wren himself. I nearly forgot to mention important sculptures in the St Paul’s art collection, so I’ll leave you with these two effigies to the Virgin Mary and baby Jesus. The more recent (left) is by preeminent British sculptor, Henry Moore, the other recently returned in 2014 to the halls of St Paul’s after being repaired from bomb damage in WWII. St Paul’s offers a thoughtful and unique combination of art and faith that appeals to a broad audience; it’s a space in which art transcends the limits of a soulless white cube gallery and religion is not required to appreciate and enjoy visiting a cathedral. Read more about William Holman Hunt’s “Light of the World” at St Paul’s Cathedral – the original is at Keble College, Oxford, and the third can be seen at Manchester City Art Gallery. Visiting St. Paul’s Cathedral art: St. Paul’s is located in St Paul’s Churchyard, London, EC4M 8AD and can be visited Monday through Saturday, 8:30AM – 4:30PM. Paid admission (concessions); step-free access. Here’s a tip: validate your ticket with your signature, and hang onto it; you can use that ticket for 12 months to re-enter St Paul’s.